This melting pequi* oil mask hydrates, nourishes, tones curls without weighing them down and prevents the appearance of frizz. For 95% of women having tested it, the curls have more bounce, better definition, are lighter and silky**. * In Brazil, pequi fruit are harvested at maturity by local communities to earn a sustainable income. The fruit are then pressed in an eco-responsible factory. ** Use test conducted with 22 women for 21 days – self-assessment results. AQUA/WATER, CETEARYL ALCOHOL, ORBIGNYA OLEIFERA SEED OIL, SQUALANE, BEHENTRIMONIUM CHLORIDE, STEARALKONIUM CHLORIDE, PANTHENOL, TRIETHANOLAMINE, HYDROLYZED ADANSONIA DIGITATA EXTRACT, DIPROPYLENE GLYCOL, PARFUM/FRAGRANCE, PHENOXYETHANOL, DICAPRYLYL ETHER, CITRIC ACID, LAURYL ALCOHOL, POLYQUATERNIUM-22, HYDROLYZED WHEAT PROTEIN, GUAR HYDROXYPROPYLTRIMONIUM CHLORIDE, GLYCERIN, ETHYLHEXYLGLYCERIN, CARYOCAR BRASILIENSE FRUIT OIL, PEG-4 DISTEARYL ETHER, SODIUM LAURETH SULFATE, ILLITE, DISTEARYL ETHER, SODIUM BENZOATE, CARBOMER, SORBITOL, SODIUM CITRATE, LECITHIN, HYALURONIC ACID, CAPRYLYL GLYCOL, TOCOPHEROL, XANTHAN GUM, DISODIUM EDTA, GLYCERYL CAPRYLATE. 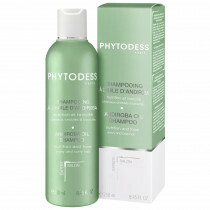 Après le shampooing PHYTODESS, sur cheveux essorés, appliquez sur les longueurs et faites pénétrer en massant mèche par mèche. Laissez poser 5 minutes, puis rincez abondamment. Ce soin peut s’utiliser après chaque shampooing. Évitez tout contact avec les yeux.